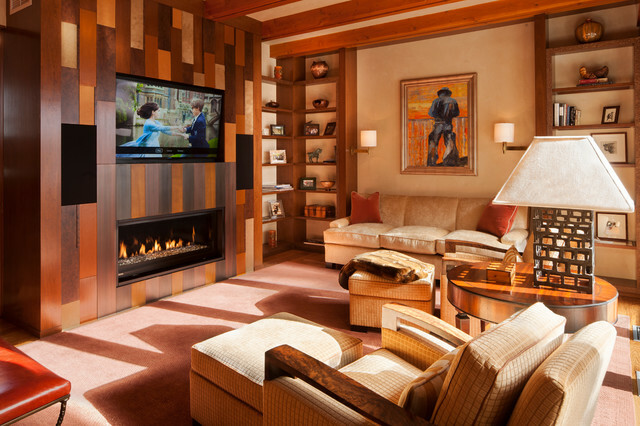 Colorado Ski House - Transitional - Family Room - Philadelphia - by Patricia Gorman Associates, Inc.
Where to start? The beautiful sunset palatte, or that spectaculy fireplace/entertainment wall? SIMILAR COWBOY PAINTING BUT I BELIEVE THE ONE I CHOSE IS MUCH MUCH NICER. NOTHING ELSE RELATES TO HUMBLE MUCH AT ALL AND I AM ASSUMING THE PAINTING IS WHAT MADE YOU CHOSE IT?? ?